Custom Leather Belts. Hand Crafted in the USA. We hand make our custom leather belts to your requirements. You can now own a high quality leather belt that is unique and made specially for you instead of a mass marketed brand name. Our belts are not imported. All of our products are made in the USA including the manufacturing of the leather and converting of the final product. We will hand make your belt from top of the line full grain thick harness leather or bridle leather. The leather we use is expensive pit tanned Shoulders, Bends, or Backs, depending on the length needed. All of our hand made custom leather belts have a 100% guarantee to be free of defects in material and workmanship. If you are not 100% satisfied with the product, just give us a call within 30 days of receipt and let us know what we need to do. We will do whatever it takes to make you happy. We also provide a One Year Warranty against defects in material and workmanship. Please see our Warranty and Return Policy page for details. Ordering is Easy! Customers can build their own custom leather belt from a list of options. At the bottom of the page for Mens Leather Belts, Women's Leather Belts, Bridle Leather Belts, Leather Work Belt and Leather Straps there is an area where you can build your belt from the list of available options. 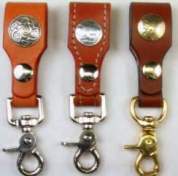 You will be able to select the width, color, buckle, finish and Harness or Bridle leather. If you just need a belt strap and no buckle see the Leather Belt No buckle page. We also offer Tapered Belts, Gun Belts and Braided Belt. To order go to the bottom of each page. About our custom leather belts. All of the belts listed on the Men's Leather Belts page are made from harness leather. If you want a belt made with Bridle Leather see the Bridle Belts or Leather Work Belts pages. Many of the other styles of belts we offer are available in both bridle or harness leather. Men's Harness Leather Belts are hand dyed at our shop. Harness leather is available in five colors. Black, Dark Brown, Medium Brown, Light Brown, and Tan. Natural unfinished leather can also be ordered. 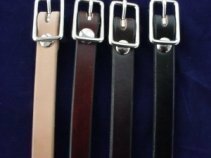 A color chart for harness leather is available on the Men's Leather Belts page. Black, dark brown, light brown and tan harness leather belts you can choose to have the back of the belt left natural or sealed. Bridle leather is available in Black, Dark Brown, Medium Brown, British Medium Brown, Light Brown and Tan. All bridle leather is purchased dyed and sealed on both sides from the tannery. A bridle leather color chart is available on the Bridle Leather Belts page. Belts are available in widths of 1", 1-1/4", 1-1/2" and 1-3/4" with lengths up to 65". Solid brass or nickel over solid brass buckles in a variety of shapes are available to choose from. The buckles are removable to accommodate any buckle you want. Belt Measurement. Please see belt measurement for detailed sizing instructions to make sure you order the correct size. There are two instructions. One for ordering a belt with a buckle (from our website) and one for ordering a belt without a buckle (ordering a belt for a buckle you already have). 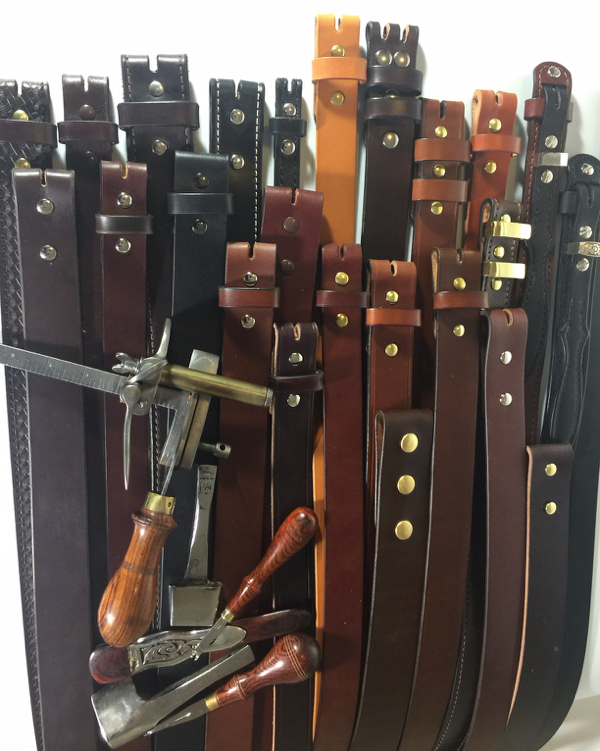 Whatever way you decide to build your custom leather belt you can be assured you're getting the quality you deserve and a belt that will last for years to come! Also if you have a special requirement or feature needed that is not listed just ask. I should be able to accommodate your needs. We pride ourselves on our products quality. We strive to work with you to ensure your satisfaction. Our custom leather belts and straps are shipped within 5 days or less! Most of the time our products ship within two days - No middlemen markups! - Direct From the Shop! - Made in the USA! - Finest Quality Leather and Workmanship! If you want a real leather belt this is the place to get one. Jason from Dallas, TX: "I got my belt today. It's perfect! The black belt with the nickel buckle and stay looks great. Thank you for all of your help." Fran from Cleveland, OH: "Just wanted to say thanks again. The belt that you designed for me is gorgeous. Craig from Atlanta, GA: " A quick note to let you know my wife loved the belt. Thanks for helping me score a few points." Linda from Toronto, ON: Received my belt yesterday and wore it to dinner last night that I had with several friends and received a several compliment. I gave them your web site info. Tess from Miami, FL: Hey Ken - I received the belts on Tues. They are beautiful. Thank you for all your expert suggestions." Jeremy from Los Angeles, CA: I purchased a belt strap from CLB. It was made to fit a buckle that was given to me as a gift. Ken hand made the belt exactly to my requirements. Good value and high quality product. Patrick from Houston, TX: I received the belt. It's beautiful. Love the natural color. I can tell it is very nice high quality. Billy from NYC: Just wanted to let you know that the money belt came today. It is excellent! Just in time before I leave for vacation. Thank you very much, Billy. Dale M. from San Francisco, CA: Several months after receiving a bridle work belt from custom leather belts it is still looking great. Very durable belt. Thank you. Over 2000 of the Best Artists and Craftspeople on the World Wide Web!